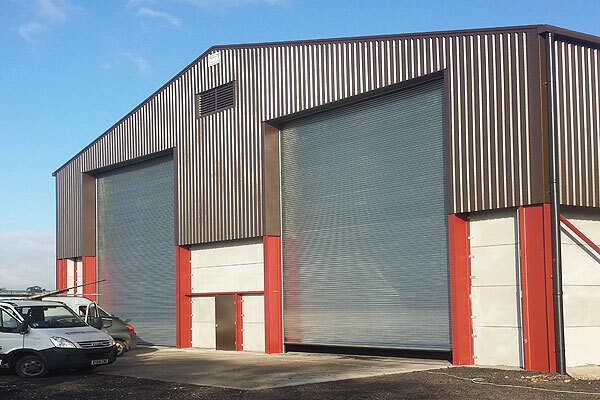 We designed, manufactured and installed 2 number very large industrial roller shutter doors for a very bespoke grain store application in the vale of Evesham during the late summer of 2013. The doors were manufactured to provide a clear opening width of 7metres and a clear opening height of 9metres, to allow large grain lorries to tip a full load into the grain store and whilst still in a tipped position drive out of the grain store building thus enabling ease of unloading the grain and reducing the risk of impact to the roller shutter doors to zero. This function can also help in this application if the grain still has a high moisture content and unloading can become difficult without a full tilt on the vehicle. As a grain storage facility requires the necessary protection against vermin, insects and birds, long term storage requires well managed and purpose built buildings. 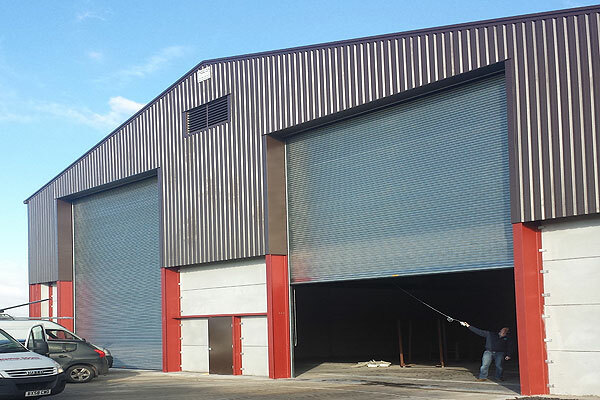 Roller shutter doors and dark internal conditions prevent rodents and birds from taking up residence and ongoing monitoring measures moisture content, grain temperature and insect activity. The UK Code of Good Storage Practice and the food standards agency promote good storage practice and the same minimises risk throughout the supply chain and safeguards food safety for consumers. Safe, effective grain storage is key to assuring crop quality and helping prevent loss of premiums through claims and rejections. Despite this very bespoke application and the large size of the doors Worcester Doors Limited again designed, manufactured and provided installation to a high specification power operated industrial roller shutter doors with inbuilt seals and brush strips to prevent vermin access. This enabled the farmer to store his grain in a secure and safe environment, with a simple press of a single button.